Harold Meek is described by everyone as a gentleman, a perfectionist, and one who loved the horn. He was the first editor of The Horn Call and was responsible for this statement in every issue, "The International Horn Society recommends that HORN be recognized as the correct name for our instrument in the English language." Meek grew up in the family farmhouse in Newark OH, an old house that he later rebuilt. He studied at Denison University (Ohio), with Anton Horner at Curtis, and with Arcadi Yegudkin at Eastman. He was principal horn of the Rochester Philharmonic (1942-1943), principal and third horn of the Boston Symphony (1943-1963), and principal horn of the Boston Pops (1943-1963). He made solo appearances and recordings and performed chamber music. He had many friends in the horn world, including Dennis Brain.Meek taught at Denison University, Shurtleff College, New England Conservatory, Longy School of Music, and Harvard University. His scholarship included articles in publications such as The Horn Call, Symphony, and Music Educators Journal; music such as Basic Technical Studies, transcriptions for wind quintet, and reprints of out-of-print editions; and books, notably Horn & Conductor. Meek thought deeply about the horn, its history, and its music, and he combined playing and research. For all his appreciation of history, however, and his participation in one of the first period-instrument recordings in the mid-1950s, he commented, "Thank God for the invention of the valve!" He played a single B-flat horn. 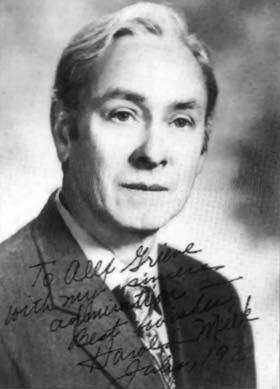 Meek was a member of the IHS Advisory Council from 1971-1976, the first editor of The Horn Call (1970-1971), and elected an IHS Honorary Member in 1980. Tributes appear in the November 1998 issue of The Horn Call.